Ponder some of the great moments in the long evolution of the book. Papyrus – This provided a durable, flexible medium for writing; a giant leap in usablity from the Sumerian clay tablets. Records were easier to keep, making possible powerful centralized governments such as Egypt. Paged, bound books – The transition from scrolls in late antiquity provided a much more portable and less awkward format for knowledge. 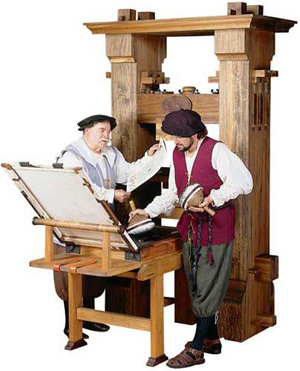 Printing press with movable type – This opened up an era of mass produced books, eventually accompanied by mass literacy. It had huge cultural and political ramifications. The greater demand for books meant that publishers who could feed that demand with diverse offerings succeeded. Each of these innovations was a major disruptive force, leading to cultural and political change. The full impact these developments were to have was probably not appreciated at the time. I wonder if we can fully comprehend the future impact of all the changes we are now seeing in the publishing industry. To try, I would like to take out the crystal ball and envision life in publishing a decade or so from now. So, close your eyes and fast forward a few short years into the future. Production at the point of purchase, originally embodied in the Espresso Book Machine, has become commonplace. 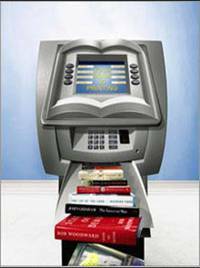 The technology has improved to the point where consumers have come to expect that they can buy any book anywhere, and have it in a couple of minutes. The elimination of inventory, returns and distribution costs together with the availability of product in a wide variety of venues has led to lower cost books. The universality of the web, combined with enhanced search / recommendation capabilities and the viral power of social media has made it possible to find and aggregate niche markets at low cost. Publishers also begin to realize that all online marketing and PR will continue to turn up in consumer searches long after the book is released. Each time this happens, there is the opportunity it will lead to a purchase. This means that their web marketing has a much longer shelf life and a higher cumulative return. Authors develop their work on blogs, testing every piece of content, building and measuring their audience as they go. Their pitches to publishers and agents are as much about their audience metrics as about the work itself. Savvy authors skip the pitch altogether, publish their own work and do their own marketing. The new environment creates new opportunities for publishing success. And the biggest opportunity is further out on the long tail of books available for purchase. The emphasis shifts away from finding and funding a few bestsellers to aggregating a lot of small and medium sellers with proven markets. Publishers realize that every book has a market, a small market perhaps . But the carrying cost (production, inventory, distribution, returns) of these “long tail” titles is negligible. And once the modest initial development and marketing expenses have been repaid, it’s all profit. It’s also easy and inexpensive to bring out new editions to keep titles current. Bottom line: a big backlist generates a comfortable and dependable annuity. What this ultimately means is hard to say. Certainly, we’ll see more authors, more publishers and more titles. This could lead to a more participative literacy – where a greater number of individuals both andwrite books. We’re already seeing this phenomenon in the blogosphere and it could soon be echoed in book publishing once technology has reshaped the economics of book production and marketing. This entry was posted in book marketing, open publishing, publishing analytics, publishing strategy, publishing technology, readership strategies and tagged espresso book machine, long tail, production at the point of purchase, web marketing. Bookmark the permalink.